If you have questions regarding the ream and run procedure, feel free to email Frederick A. Matsen III at matsen@uw.edu. Rotator cuff tear arthropathy (arthritis with a massive rotator cuff tear) is a devastating condition that seriously compromises the comfort and function of the shoulder. This condition is characterized by the permanent loss of the rotator cuff tendons and the normal surface of the shoulder joint. These tissues cannot be restored to their normal condition and the lost comfort and function of the shoulder cannot be totally regained. However in the hands of an experienced surgeon and in a well-motivated individual shoulder replacement surgery with a cuff tear arthropathy (CTA) head prosthesis along with post-surgical rehabilitation can help restore substantial comfort and function to shoulders damaged by cuff tear arthropathy. 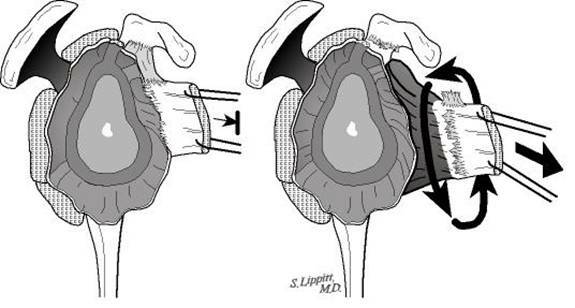 When the rotator cuff is essentially intact shoulder arthritis is often best treated by total shoulder replacement. If you have questions regarding this procedure, please feel free to email Dr. Matsen at matsen@uw.edu. 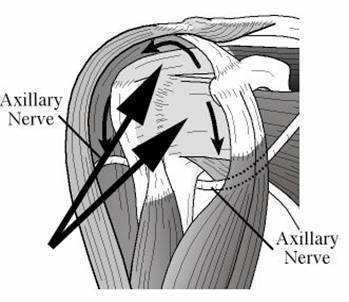 More detail about shoulder arthritis with a massive rotator cuff tear and the treatment options can be found below. 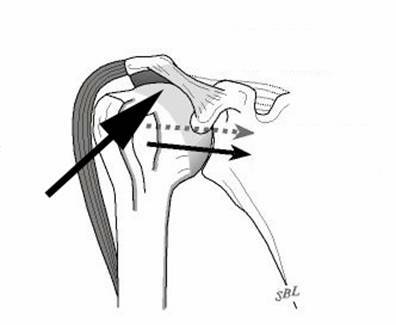 In the normal shoulder the rotator cuff muscles including the supraspinatus help balance the ball of the arm bone (humeral head) in the socket against the upward pull of the deltoid muscle. [Figure 1]. 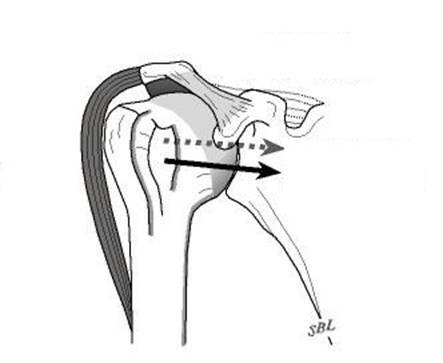 In rotator cuff tear arthropathy the rotator cuff tendons that normally are interposed between the humeral head and the overlying coracoacromial arch become progressively thinned until the humeral head moves upwards and rubs against the bone of the arch. 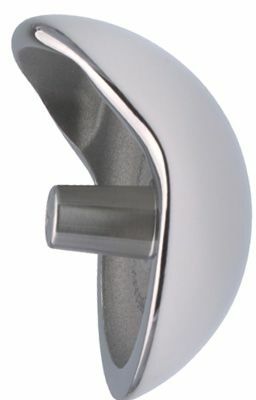 [Figure 2]. After performing a clinical exam a shoulder surgeon experienced with rotator cuff tear arthropathy can suggest what type of surgery is most likely to be helpful to the individual with the condition. Individuals are most likely to benefit from this surgery if they are well motivated and in good health. 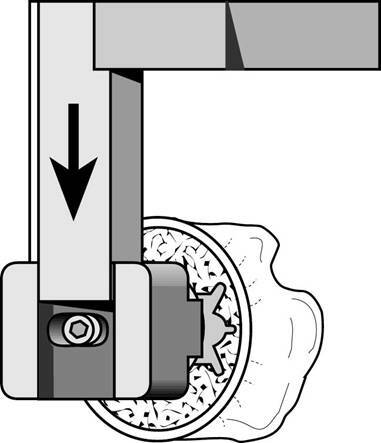 Shoulders demonstrating changes of Stages 1A 1B and 2A with substantial loss of comfort and function are considered for shoulder arthroplasty using a cuff tear arthropathy (CTA) prosthesis as described in this article. Shoulders with stage 2B cuff tear arthropathy with substantial loss of comfort and function are considered for the reversed (reverse Delta) prosthesis because the cuff tear arthropathy (CTA) prosthesis may not provide sufficient stability for the humeral head (ball of the shoulder joint). 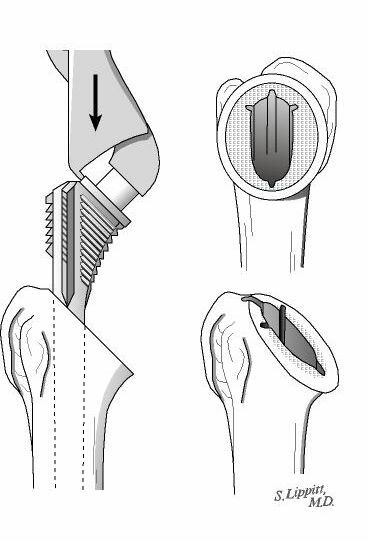 The reversed (reverse Delta) prosthesis is designed with a socket where the ball (head of the humerus) is normally located and a ball where the socket (glenoid) is usually located. 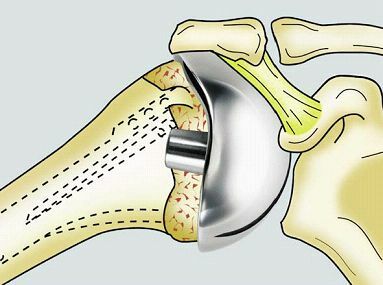 The goal of shoulder replacement arthroplasty with a cuff tear arthropathy (CTA) prosthesis is to restore the best possible function to the joint by removing scar tissue balancing muscles and replacing the destroyed joint surface of the humerus (arm bone) [Figure 8] with an artificial one especially designed for that purpose [Figure 9]. 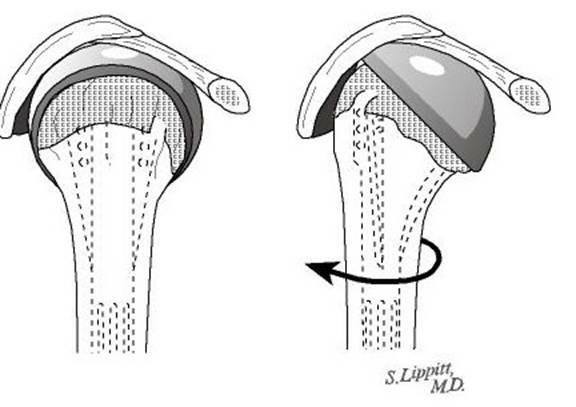 The humeral ball is fixed to the humerus (arm bone) by press fitting its stem inside the bone. 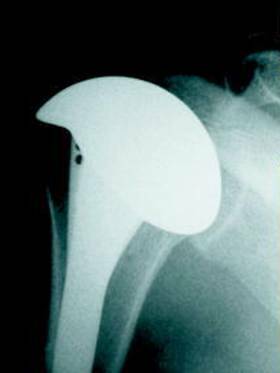 Shoulder joint replacement arthroplasty with a cuff tear arthropathy head is a highly technical procedure and is best performed by a surgical team who performs this surgery often. Such a team can maximize the benefit and minimize the risks. The two-hour procedure is performed under general (or nerve block) anesthesia. 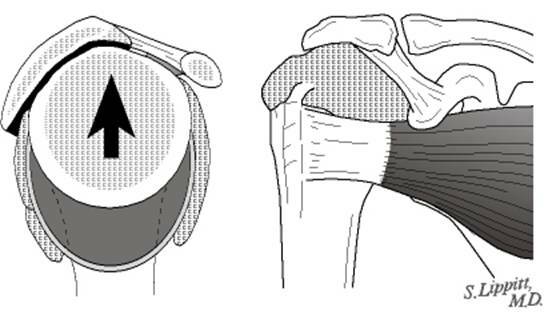 Shoulder motion is started immediately after the procedure. Individuals having this procedure learn to do their own physical therapy and are usually discharged three days after surgery if they are comfortable and have a good range of passive motion. The recovery of strength and function may continue for up to a year after surgery. Rotator cuff tear arthropathy (or shoulder arthritis with a large rotator cuff tear) is a severe and complex form of shoulder arthritis in which the shoulder has lost not only the cartilage that normally covers its joint surface but also the tendons of the rotator cuff tear which help position and power the joint. 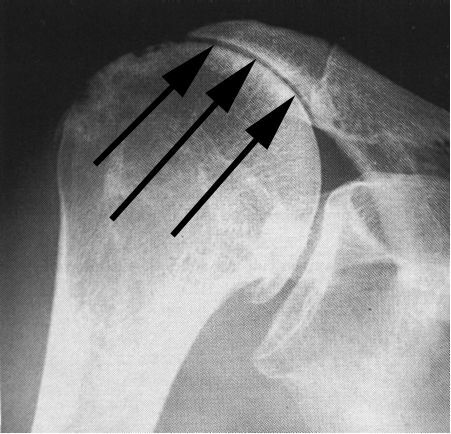 In cuff tear arthropathy the upper surface of the ball of the upper arm bone (humeral head) becomes roughened as it rubs against the overlying bone (the acromion) as shown by the arrow. [Figure 12]. This condition results in shoulder pain weakness stiffness and grinding on movement. 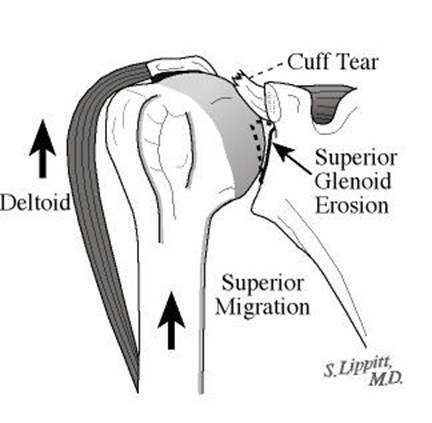 Rotator cuff tear arthropathy appears to be a condition with a succession of stages depending on the stability of the humeral head (ball of the shoulder joint) in respect to the glenoid (socket of the shoulder joint). These stages have been described at the beginning of this article. 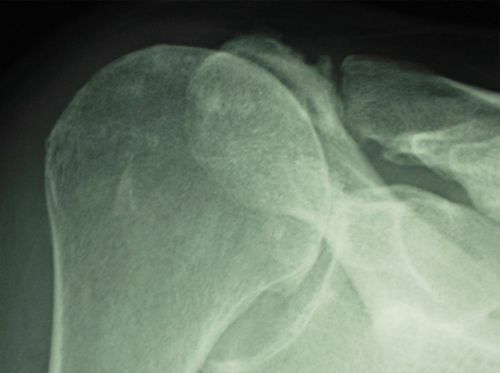 Shoulder arthritis with a massive cuff defect must be distinguished from arthritis without substantial rotator cuff involvement from isolated rotator cuff disease from frozen shoulder and from neck arthritis each of which may produce somewhat similar symptoms. Arthritis usually gives rise to stiffness without weakness. Rotator cuff tears usually cause pain and weakness but stiffness is less common. Frozen shoulder is characterized by shoulder stiffness but the X-rays are usually normal. Neck arthritis may cause shoulder pain and weakness that is worse when the head is held in certain positions. Rotator cuff tear arthropathy (or shoulder arthritis with a large rotator cuff tear) most commonly occurs in individuals over the age of 65 and is more common in women than men. Rotator cuff tear arthropathy (arthritis of the shoulder associated with a massive cuff tear) is best diagnosed by an orthopedic surgeon with experience in shoulder disorders. Certain surgeons specialize in rotator cuff tear arthropathy (arthritis of the shoulder associated with a massive cuff tear). Such individuals may be found in the shoulder services of major schools of medicine. Mild analgesic medications may relieve some of the symptoms of cuff tear arthropathy. If the symptoms of rotator cuff tear arthropathy (shoulder arthritis with a massive rotator cuff tear) are mild the condition may be treated with gentle motion exercises and exercises to strengthen the deltoid and other muscles around the shoulder that remain intact. When combined with a good rehabilitation effort shoulder joint replacement arthroplasty with a cuff tear arthropathy (CTA) head prosthesis allows arthritic shoulders to regain some of their lost comfort and function. In experienced hands this procedure can address the restricting scar tissue that frequently accompanies rotator cuff tear arthropathy. It can also restore smooth stabilizing joint surfaces when these surfaces have been damaged by rotator cuff tear arthropathy. 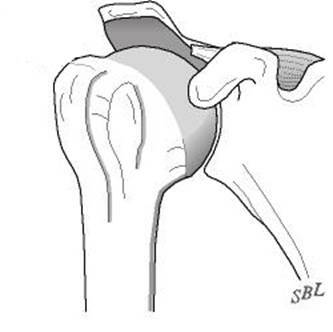 Joint replacement surgery can improve the mechanics of the shoulder but cannot make the joint as good as it was before the onset of rotator cuff tear arthropathy. In cuff tear arthropathy the tendons and muscles around the shoulder have deteriorated before the shoulder replacement. After the surgery it may take months of gentle exercises before the shoulder achieves maximum improvement. The effectiveness of the procedure depends on the health and motivation of the individual the condition of the shoulder and the expertise of the surgeon. 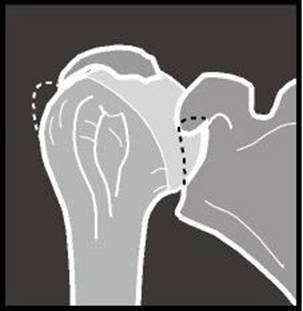 When performed by an experienced surgeon experience has shown that shoulder replacement arthroplasty with a cuff tear arthropathy head can provide improved shoulder comfort and function. The greatest improvements are in the ability of the individual to sleep and to perform some of the simple activities of daily living. 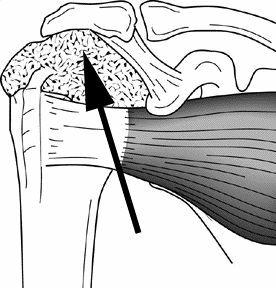 In that the tendons of the rotator cuff are not repairable in this condition normal strength and function of the shoulder cannot be regained. 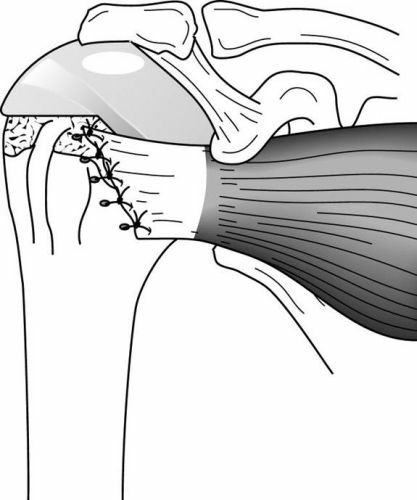 Three types of surgery can be helpful in the management of rotator cuff tear arthropathy (shoulder arthritis associated with massive rotator cuff defects). 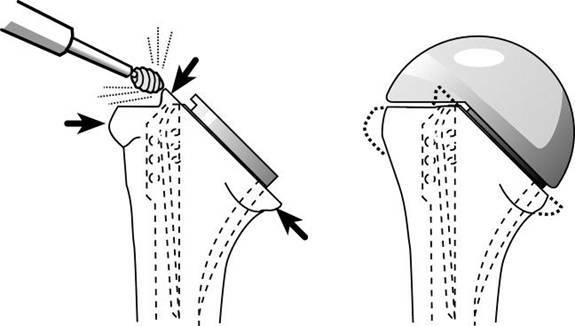 The surgical procedures can range from a simple smoothing of the roughened bone [Figure 15] to a resurfacing of the humeral head with a smooth prosthesis such as a CTA head fixed to the shaft of the arm bone (humerus) [Figure 16]. 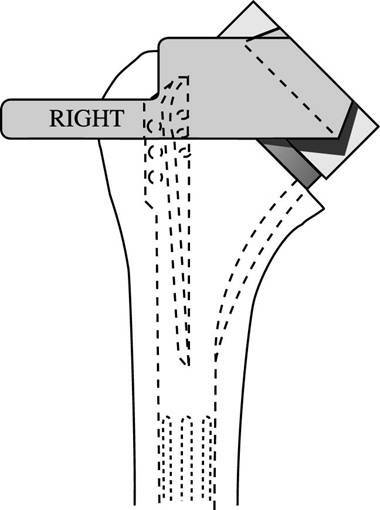 If the joint is unstable a reversed prosthesis such as the reverse Delta [Figure 17] may be needed. Who should consider shoulder joint replacement surgery with a rotator cuff tear arthropathy (cta) prosthesis? the surgeon is experienced in shoulder replacement surgery with a rotator cuff tear arthropathy (CTA) prosthesis. Shoulder replacement surgery with a rotator cuff tear arthropathy head prosthesis is most effective when the individual follows a simple exercise program after surgery. Thus the individual ? ?s motivation and dedication are important elements of the partnership. The rate of progression of rotator cuff tear arthropathy (shoulder arthritis with a massive rotator cuff defect) is usually slow thus surgery is not urgent. 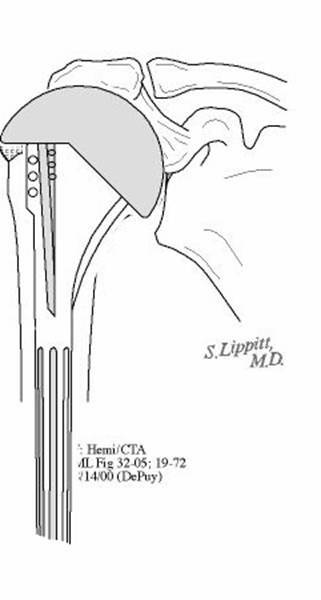 Three types of surgery can be helpful in the management of rotator cuff tear arthropathy (shoulder arthritis associated with massive rotator cuff defects). The surgical procedures can range from a simple smoothing of the roughened bone to a resurfacing of the humeral head with a smooth prosthesis such as a CTA head fixed to the shaft of the arm bone (humerus). 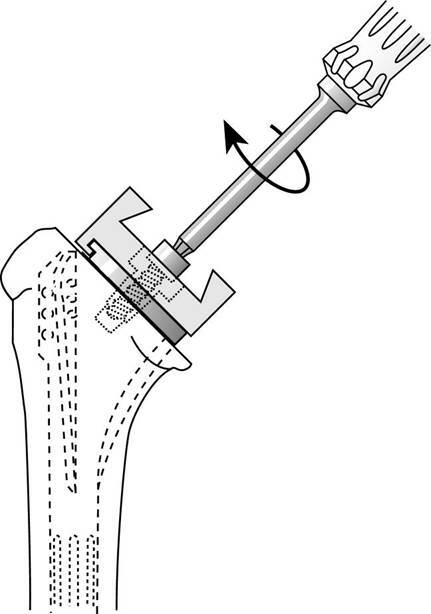 If the joint is unstable a reversed prosthesis such as the reverse Delta may be needed. In the hands of an experienced surgeon shoulder arthroplasty with a rotator cuff tear arthropathy prosthesis can be helpful in restoring comfort and function to the shoulder of a well-motivated individual. The greatest benefits are often the ability to sleep on the affected shoulder and the ability to perform simple activities of daily living. As long as the shoulder is cared for properly and subsequent injuries are avoided the benefit can last for years. In that rotator cuff tear arthropathy progresses slowly consideration of surgery is not urgent. Before surgery is undertaken the individual needs to be in optimal health understand and accept the risks and alternatives of surgery and understand the postoperative rehabilitation program. Only if there is concern about the possibility of infection in a swollen warm and red shoulder does urgent surgery demand consideration. Like all surgical procedures shoulder replacement surgery for rotator cuff tear arthropathy carries risks that are important for the individual to consider. The risks of this surgery include but are not limited to the following: infection (which can be sufficiently serious to require revision surgery including removal of the prosthesis) injury to nerves and blood vessels fracture stiffness or instability of the joint loosening of the prosthesis pain failure of tendon or muscle attachment and the need for additional surgeries ? any or all of which may result in major loss of function to the arm. There are also risks of anesthesia and blood transfusion (although transfusions are not usually necessary). An experienced shoulder joint replacement team will use special techniques to minimize these risks but cannot totally eliminate them. Many of the risks of shoulder replacement surgery can be effectively managed if they are promptly identified and treated. Infections may require a wash out in the operating room--occasionally removal of the prosthesis is necessary. Blood vessel or nerve injury may require repair. Fracture may require surgical fixation. Stiffness or instability may require exercises or additional surgery. Loosening of the prosthesis may require surgical revision. If the individual has questions or concerns about the course after surgery the surgeon should be informed as soon as possible. Shoulder joint replacement surgery with a rotator cuff tear arthropathy (CTA) prosthesis is considered for healthy and motivated individuals in whom cuff tear arthropathy interferes with the comfort and function of the shoulder. Successful shoulder replacement depends on a partnership between the individual and the experienced shoulder surgeon. Individuals should optimize their health so that they will be in the best possible condition for this procedure. Smoking should be stopped a month before surgery and not resumed for at least three months afterwards. Any heart lung kidney bladder tooth or gum problems should be managed before surgery. Any infection may be a reason to delay the operation. The shoulder surgeon needs to be aware of all health issues including allergies and the non-prescription and prescription medications being taken. Some of these may need to be modified or stopped. For instance aspirin and anti-inflammatory medication may affect the way the blood clots. The incision used for a shoulder replacement with a cuff tear arthropathy prosthesis is usually made across the front of the shoulder. [Figure 18]This area of skin must be clean and free from sores and scratches. Before surgery the individual should consider the limitations alternatives and risks of surgery. Individuals should also recognize that the result of surgery depends in large part on their efforts in rehabilitation after surgery. The individual needs to plan on being less functional than usual for six to twelve weeks after the procedure. Driving shopping and performing usual work or chores may be difficult during this time. Plans for necessary assistance need to be made before surgery. For individuals who live alone or those without readily available help arrangements for home help should be made well in advance. Shoulder replacement arthroplasty can be delayed until the time that is best for the individual's overall health and convenience. However excessive delays can result in the loss of bone making the reconstruction more difficult for the surgeon and the individual. The surgeon's office should provide a reasonable estimate of the surgeon's fee and the hospital fee. 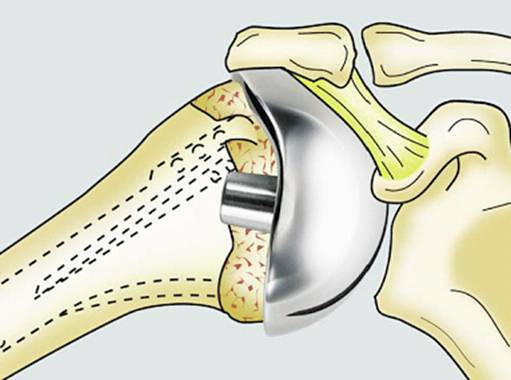 Shoulder replacement arthroplasty for cuff tear arthropathy is a technically demanding procedure that should be performed by an experienced surgeon in a medical center accustomed to performing similar shoulder joint replacements at least several times a month. Individuals should inquire as to the number of shoulder arthroplasty procedures that the surgeon performs each year and the number of these procedures performed in the medical center each year. Because relatively few shoulder arthroplasties are performed in the United States each year it is unlikely that every community has an experienced shoulder arthroplasty surgeon who frequently performs arthroplasties for cuff tear arthropathy . Surgeons specializing in shoulder joint replacement may be located through university schools of medicine county medical societies or state orthopedic societies. Other resources include local rheumatologists or professional societies such as the American Shoulder and Elbow Surgeons society. Shoulder replacement arthroplasty is usually performed in a major medical center that performs these procedures on a regular basis. These centers have surgical teams and facilities specially designed for this type of surgery. They also have nurses and therapists who are accustomed to assisting individuals in their recovery from shoulder replacement surgery. Shoulder replacement surgery for cuff tear arthropathy is a highly technical procedure; each step plays a critical role in the outcome. 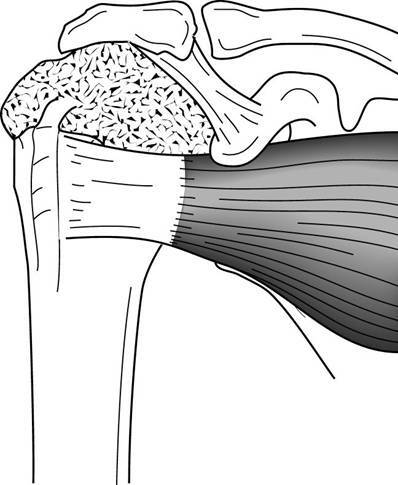 The socket of the joint is usually not replaced in cuff tear arthropathy because of the substantially increased incidence of glenoid component loosening and failure in this condition. 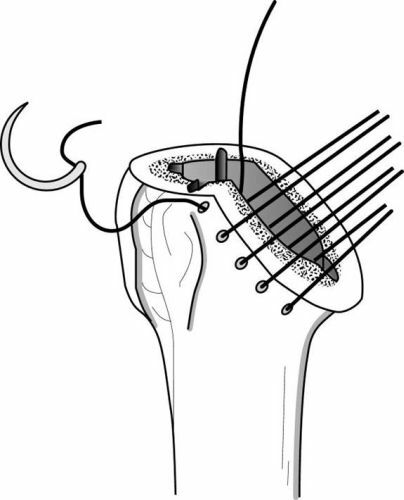 At the conclusion of this procedure the subscapularis tendon is securely repaired to the bone. [Figures 33 and 34] is repaired and requires protection from active use for at least 6 weeks while it is healing. Shoulder joint replacement surgery may be performed under a general anesthetic or under a brachial plexus nerve block. The individual should discuss his or her preferences with the anesthesiologist before surgery. The procedure usually takes approximately two hours however the preoperative preparation and the postoperative recovery may add several hours to this time. Individuals often spend two hours in the recovery room and two to four days in the hospital after surgery. Recovery of comfort and function after humeral prosthetic arthroplasty with a cuff tear arthropathy head is progressive after the surgery. Often the benefits become apparent to the individual after two to six weeks. This partial joint replacement procedure is a major surgical procedure that involves cutting of skin tendon and bone and removal of scar tissue as well as resuturing of tendon back to bone. The pain from this surgery is managed by the anesthetic and by pain medications. Immediately after surgery strong medications (such as morphine or Demerol) are often given by injection and by mouth as needed. Within a day or so oral pain medications (such as hydrocodone or Tylenol with codeine) are usually sufficient. On the other hand some individuals need surprisingly little pain medication after this procedure. In older individuals it is often safer to use relatively less pain medication. Initially after surgery pain medication can administered by mouth in the vein (intravenously) or in the muscle (intramuscularly). Sometimes patient controlled analgesia (PCA) is used to allow the individual to administer the medication as it is needed. Hydrocodone or Tylenol with codeine are taken by mouth. Intravenous pain medications are usually needed only for the first day or two after the procedure. Oral pain medications are usually needed only for the first two weeks after the procedure. Some individuals need surprisingly little pain medication after this procedure. In older individuals it is often safer to use relatively less pain medication. Pain medications can be very powerful and effective. Their proper use lies in the balancing of their pain relieving effect and their other less desirable effects (such as slowed breathing sleepiness nausea constipation or difficulty urinating). Good pain control is an important part of the postoperative management. Pain medications can cause drowsiness slowness of breathing difficulties in emptying the bladder and bowel nausea vomiting and allergic reactions. Individuals who have taken substantial narcotic medications in the recent past may find that usual doses of pain medication are less effective. For some individuals balancing the benefit and the side effects of pain medication is challenging. Individuals should notify their surgeon if they have had previous difficulties with pain medication or pain control. After surgery the individual spends an hour or so in the recovery room. A drainage tube is usually used to remove excess fluid from the surgical area. The drain is usually removed on the second day after surgery. Bandages cover the incision. They are usually changed the second day after surgery. Individuals are discharged as soon as the incision is dry the shoulder is comfortable with oral pain medications the individual can perform the range of motion exercises and the home support systems for the individual are in place. Discharge is usually on the third or fourth day after surgery. 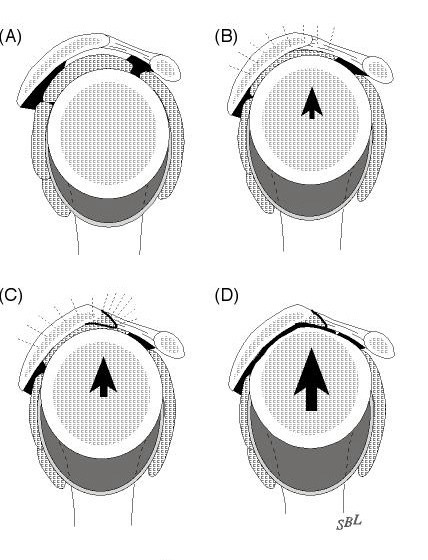 Early motion after shoulder replacement is helps achieve the best possible shoulder function. Arthritic shoulders are stiff. One of the major goals of shoulder replacement surgery is to relieve much of this stiffness. However after surgery scar tissue will tend to recur and limit movement unless motion is started promptly. This early motion is facilitated by the complete surgical release of the tight tissues so that after surgery the individual has only to maintain the range of motion achieved at the operation. A continuous passive motion (CPM) machine is often used to gently move the shoulder in the recovery room immediately after surgery. 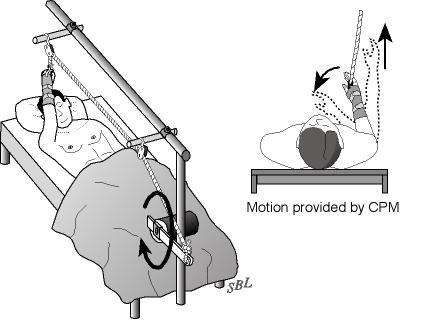 A continuous passive motion (CPM) machine is used for the first few days after surgery whenever the individual is in bed. [Figure 36]. During the hospitalization the individual learns a simple rehabilitation program that will be used for maintaining the range of motion at home after discharge. [Figure 37] On the day of surgery or on the day after the physical therapist teaches the individual gentle range of motion exercises to prevent stiffness and adhesions. Walking and use of the arm for gentle activities are encouraged soon after surgery. At the time of discharge the individual should be relatively comfortable on oral medications should have a dry incision should understand their exercises and should feel comfortable with the plans for managing the shoulder. For the first month or so after this procedure the operated arm may be less useful than it was immediately beforehand. The specific limitations can be specified only by the surgeon who performed the procedure. It is important that the repaired tendon not be challenged until it has had a chance to heal. Usually the individual is asked to lift nothing heavier than a cup of coffee for six weeks after the surgery. Management of these limitations requires advance planning to accomplish the activities of daily living during the period of recovery. Individuals usually require some assistance with self-care activities of daily living shopping and driving for at least six weeks after surgery. They usually go directly home after this surgery especially if there are people at home who can provide the necessary assistance or if such assistance can be arranged through an agency. In the absence of home support a convalescent facility may provide a safe environment for recovery. Recovery of comfort and function after shoulder arthroplasty continues for many months after the procedure. Improvement in some activities may be evident as early as six weeks. With persistent effort individuals can make progress for as long as a year after surgery. 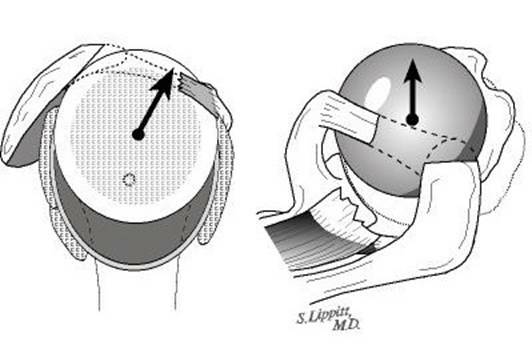 Early motion after total shoulder replacement is critical for achieving optimal shoulder function. Arthritic shoulders are stiff. One of the major goals of shoulder replacement surgery is to relieve much of this stiffness. However after surgery scar tissue will tend to recur and limit movement unless motion is started immediately. This early motion is facilitated by the complete surgical release of the tight tissues so that after surgery the individual has only to maintain the range of motion achieved at the operation. Later on once the shoulder is comfortable and flexible strengthening exercises and additional activities can started. However most individuals find the recovery of comfort and function can be accomplished without formal physical therapy. It is often most effective for the individual to carry out her or his own exercises so that they are done frequently effectively and comfortably. Usually a physical therapist or the surgeon instructs the individual in the exercise program during the hospital stay and advances it at a rate that is comfortable for the particular individual. 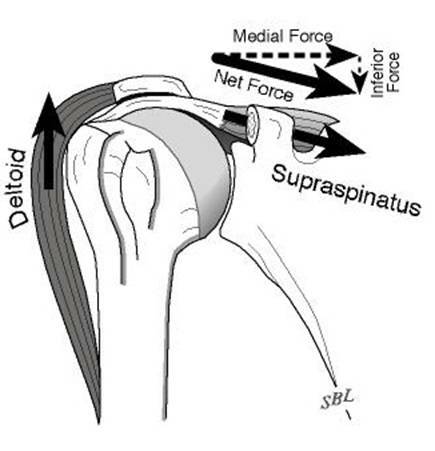 For the first six weeks after surgery emphasis is placed on optimizing the flexibility and range of motion of the shoulder through gentle stretching exercises. After six weeks these stretching exercises are continued and strengthening exercises can be added. In general the exercises are best performed by the individual at home. Occasional visits to the surgeon or therapist may be useful to check the progress and to review the program. Individuals are almost always satisfied with the increases in range of motion comfort and function that is achieved with the exercise program. If the exercises are uncomfortable difficult or painful the individual should contact the therapist or surgeon promptly. Once the range of motion and strength goals are achieved the exercise program can be cut back to a minimal level. However gentle stretching is recommended on an ongoing basis. In general individuals are able to perform gentle activities of daily living with the operated arm at the side starting two to three weeks after surgery. Walking with the arm protected is strongly encouraged. Driving should wait until the individual can perform the necessary functions comfortably and confidently. This may take up to six weeks if the surgery has been performed on the right shoulder because of the increased demands on the right shoulder for shifting gears. With the consent of their surgeon individuals may be able to return to activities such as water exercises and golf as tolerated by their shoulder at six months after surgery. 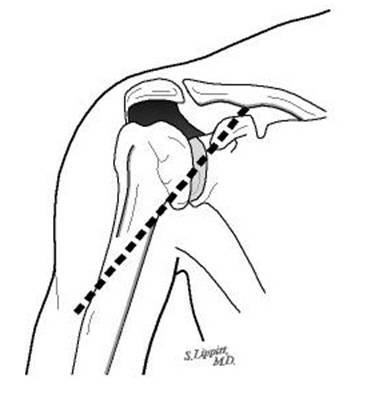 It is important to remember that shoulder arthroplasty with a cuff tear arthropathy (CTA) prosthesis does not restore the function of the degenerated rotator cuff tendons so that the shoulder will never totally regain full comfort strength range of motion or function. Stressful activities and activities with the arm in extreme positions may never be possible after this procedure. Individuals should avoid activities that involve major impact (chopping wood contact sports activities with major risk of falls) or heavy loads (lifting of heavy weights heavy resistance exercises) after this surgery. In this way the risk of re-injury is minimized. The surgeon and therapist should provide the information on the usual cost of the rehabilitation program. The program is quite cost-effective because it is based heavily on home exercises. Rotator cuff tear arthropathy (arthritis with a massive cuff defect) is a devastating condition that seriously compromises the comfort and function of the shoulder. This condition is characterized by the permanent loss of the rotator cuff tendons and the normal surface of the shoulder joint. These tissues cannot be restored to their normal condition and the lost comfort and function of the shoulder cannot be totally regained. However in the hands of an experienced surgeon and in a well-motivated individual shoulder replacement surgery with a cuff tear arthropathy (CTA) head prosthesis along with post-surgical rehabilitation can help restore substantial comfort and function to shoulders damaged by cuff tear arthropathy. Pre-planning and persistent rehabilitation efforts will help assure the best possible result for the individual with rotator cuff tear arthropathy. 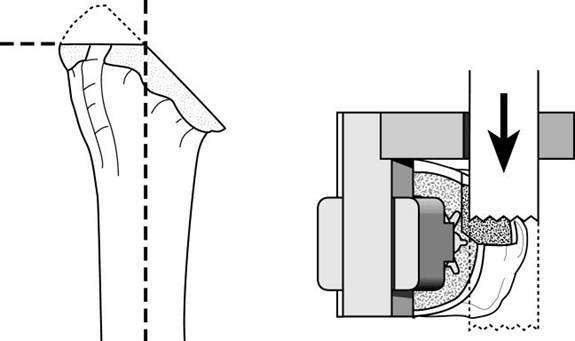 Thanks to the DePuy Company the manufacturer of the CTA head prosthesis for their permission to use the illustrations from their technical manual for this procedure.